Marshal of Indian Air Force Arjan Singh passed away in New Delhi on 16th September 2017, following a cardiac attack. He was admitted to the hospital in the morning on Saturday. He was 98. As a mark of respect to the departed dignitary, a state funeral will be accorded and national flag will fly half-mast on the day of the funeral in Delhi on all buildings where it is flown regularly. He was the only officer of the Indian Air Force who was promoted to five-star rank as Marshal. He served as Chief of the Air Staff from 1964 to 1969 and led the force in 1965 war. He also served as Ambassador to Switzerland, Vatican and was awarded the Padma Vibhushan. 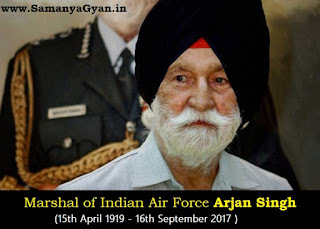 Marshal of the Indian Air Force Arjan Singh was born on 15 April 1919, in Lyalpur, He was Chief of Air Staff when the IAF saw action in its first combat of the modern age in 1965. He was hardly 44 years years of age when entrusted with the responsibility of leading the Indian Air Force. In recognition of his services, the Government of India conferred the rank of the Marshal of the Air Force onto Arjan Singh in January 2002 making him the first and the only 'Five Star' rank officer with the Indian Air Force. Arjan Singh's, testing time came in September 1965, when the subcontinent was plunged into war. He remained a flyer to the end of his tenure in the IAF, visiting forward squadrons & units and flying with them.